This tutorial will review the process of enabling an SSL certificate on your X-Cart website. The SSL will ensure that any personal or payment details they enter on your website are as protected as possible. For online stores, such as the ones developed with X-Cart, the use of SSL is recommended. To enable SSL, you first need to get a valid certificate for your domain. This is a paid service that you can order via your Client Area. The installation process is handled by our support team so you will not have to make any changes on your end. Once the SSL is installed on your domain, you can proceed with the configuration of your X-Cart store. First, log into your website as administrator and click on the System Settings tab at the top menu. 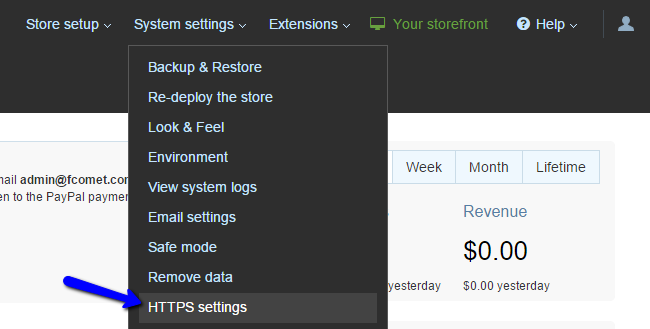 Select the HTTPS Settings option. Click on the Enable HTTPS button to force the use of SSL on your website. Make sure that you do not force the SSL use for your website, if you do not have an installed SSL certificate for it. This will make your website completely inaccessible.